Lately, we have seen a pretty substantial uptick in products for children that are iPad compatible (iPotty, anyone?). Even though these products are innovative and fun, there is some skepticism when it comes to children spending every waking moment in front of some sort of screen (and I mean every waking moment…iPotty?). Even though there is the looming thought of screen-overdose in the back of many parent’s minds, what about the products that promote creativity, critical thoughts, and physical activity? The ‘Kids Drawing Easel for iPad’ from CTA Digital does all of these things and, honestly, the end result is not that far off from children using a traditional easel with paint. The easel is designed to work with children’s apps that involve drawing and coloring by providing a space for the iPad to snap into place. It is also a fully functional traditional easel as the reverse side is a giant whiteboard that allows for technology-free play. The easel also comes with a tray that holds any needed art supplies and a crayon-shaped stylus, as well. The ‘Kids Drawing Easel for iPad’ also includes a pivoting lock that allows kids to rotate the iPad from portrait to landscape orientation and back again without the possibility of accidentally dropping it; a great feature for smaller children. Another excellent feature that come with this easel is the complete lack of mess! No dripping paint, no broken crayons, just an iPad and a dry erase board that offers almost no clean up for mom or dad. At the end of the day, isn’t that what’s really important? Well…that and your kid’s creativity of course. 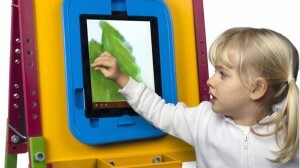 The ‘Kids Drawing Easel for iPad’ is from the same company that brought us the iPotty (surprise!) at CES this year and it is becoming obvious that CTA Digital is broaching new ways to incorporate the use of the iPad into children’s products. While some of these products may seem a little superfluous, CTA had hit the creativity nail on the head with their new easel and it is easy to see this product being incorporated into my kids daily lives.